I'm a small girl with a big appetite for great food at a good price! It’s pretty hot out…guess I’ll cool off with CUPS! Frozen Yogurt better known as “Froyo” is the latest craze at the moment. I’ve never seen so many froyo shops open at once. I remember as a kid getting TCBY used to be a treat until it went out of business. The yogurt fad died for a few years. That is until about two years ago the self-serve frozen yogurts shops began opening like Red Mango, Cups, and many more. They definitely don’t plan on going away anytime soon. It’s like every where I turn there is another one. I thought it would be hard to judge which froyo is better than the next but it actually hasn’t been. I’m actually starting to prefer creamy froyo over the tart froyo. But I’ll back track a bit, before I graduated a Cups opened in Morristown near my school. I tried it once and thought it was alright but the next time I went it grew on me and I’m hooked. Life as a post grad is going well, I love it. Of course, now I pass a Cups everyday on the way to and from work, it’s so tempting so I figured I’d have make my first post grad review post telling you all about it, #smallchickbigdeals style! Customer Service- 4.7: Everyone is friendly and willing to help out an give you samples which is alway needed in a frozen yogurt shop. The staff is young but always try there best to help you out. Atmosphere: 4.7- If you are not a fan of loud music I will be straight up with you– it’s not the place for you. They play loud techno music because they are trying to get the younger crowd to come in as well. If you don’t mind the loud music it’s worth it. Also the decor is fun and comfy. Froyo Quality: 5- As I mentioned above, their frozen yogurt has a creamy consistency to it. It’s almost like eating ice cream but it’s delicious. They also have a wide variety of flavors. I personally love the red velvet. You also have the option of having a combined flavor, ie: red velvet cake which taste great as well! They also have sorbet available in case you don’t want froyo. Price: $ – Depending on how much you fill your cup really determines how expensive it is but in all my Cups experiences it’s always been less than 10 bucks which is great. It’s definitely worth the money and a great way to indulge yourself in a healthy way! Final Score: 14.4/15- I highly recommend it if you love frozen yogurt. The variety of both froyo, sorbet and toppings is awesome. The atmosphere is fun and young and also comfy. You won’t put a hole in your wallet either! I have a feeling I’ll end up going there this weekend again! Go check it out for yourself and let me know if you agree! The masterpiece my man & I shared at Cups a few weeks ago! 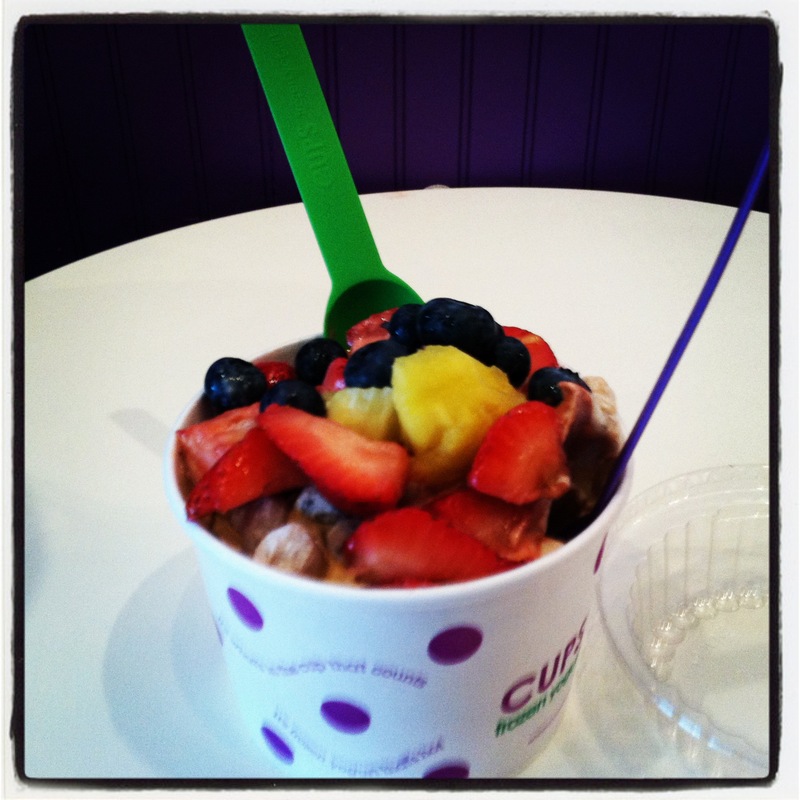 This entry was posted in food and tagged cups, froyo, healthy, nj, tasty by smallchickbigdeals. Bookmark the permalink. Hi I’m Sara Monica, founder of Small Chick Big Deals. I was born and raised by the Jersey Shore. I just graduated from Fairleigh Dickinson University in Madison, NJ with a Communications major and minoring in Public Relations and Sociology. When I’m not working, I’m usually out with my boyfriend, friends or family having a good time. Those times usually include eating one way or another. This blog is dedicated to my best and worst restaurant experiences, personal quick & easy recipes, and more! I love to eat and I know first-hand its possible to eat great food at a legitimate price. FYI most the places mentioned in my blogs are in the NJ/NY metro area since thats my hood Happy Eating!! Aw! It’s the best and my favorite by far and pretty budget friendly!